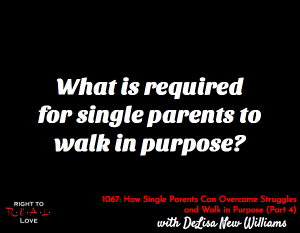 In this episode, Jay concludes his discussion with author DeLisa New Williams by addressing the question: What is required for single parents to walk in purpose? What is required for single parents to walk in purpose? The requirements for single parents to begin walking in purpose. The value in having a close and strong relationship with God. The importance of overcoming bitterness, anger and unforgiveness. The danger of single parents deciding not to walk in purpose. Why generational curses need to be broken. How the Holy Spirit can help single parents overcome the struggles in their lives. DeLisa opens up about how beneficial going to counseling was for her. You need to lean on God. Commit to spend more time with God each day.